Lily’s mermaid identity is a secret that can’t get out, since she’s not just any mermaid – she’s a Thalassinian princess. When Lily found out three years ago that her mother was actually a human, she finally realized why she didn’t feel quite at home in Thalassinia, and she’s been living on land and going to Seaview high school ever since, hoping to find where she truly belongs. Sure, land has its problems – like her obnoxious, biker boy neighbor Quince Fletcher – but it has that one major perk – Brody. The problem is, mermaids aren’t really the casual dating type – when they “bond,” it’s for life. Total cute fluff. Lily is a typical teenage girl...except she's not. She is half-human, half-mermaid. What's more - she's a princess! She grew up in Thalasinnia, a mermaid kingdom of the coast of Florida. Upon discovering when she was 14 that she was half human, she decided to try out the human world. Now she's a regular high school student. Average looks, average intelligence, average popularity. The fact that she's a mermaid has to remain a complete secret. In Lily's mermaid world, if you kiss a mermaid, you are automatically bonded for life, unless you go through a rare separation. A case of mistaken identity leads Lily to bond with Quince, the next-door neighbor, biker boy who's teased her mercilessly for years, instead of Brody, the handsome swimmer with whom Lily is hopelessly in love. Quince and Lily have to travel to Thalasinnia to get their bond separated, which becomes more complicated than Lily expects. I didn't think I was going to like Forgive My Fins at first. Lily is exactly the type of character I don't like: low self-esteem, hopelessly in love with uber-popular, uber-handsome, jerk boy, oblivious to cute boy who actually does like her, etc. But the story sucked me in. Pretty soon, I was flipping to the end of the book, because I just had to know what was going to happen - the suspense was driving me mad - and it's not even a suspenseful book. I was just invested in the characters and was desperately worried over what choice Lily would ultimately make. Despite loving this book, I spent most of it wanting to slap Lily. Here she is, in love with an unreachable boy, when there's this incredible guy practically throwing himself at her. Quince is just wonderful. Lily can't see past Quince's teasing facade. Doesn't she know that boys who tease you are secretly in love with you?! Silly girl. I love Quince's sarcasm, his easygoing nature, his humor, and his sensitive, romantic side. A perfect guy (perhaps a little on the unrealistic side - but who needs realism when you're reading a story about mermaids). Lily's mermaid world is richly developed. We learn a lot about the culture and the nature of mermaids in Forgive My Fins, but I get the feeling that we're only scratching the surface of the world the author has created. I really hope that her future books delve even more deeply into the mermaid world. The book is littered with little mermaid swear words, cliches, and proverbs that Lily learned throughout her life in Thalasinnia. Such as "son of a swordfish," "he's a blowfish," etc. The made up phrases toe the line cute versus annoying, occasionally crossing over the annoying line, but mostly remaining in the adorable category. 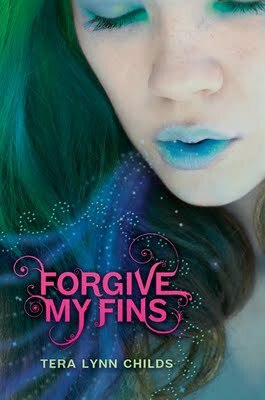 I really enjoyed Forgive My Fins. It is complete romance fluff. No real depth, but you'll read it with a smile on your face. The complete romance aside, I don't know if I'd be able to read this without thinking of that movie with Daryhl Hannah (?) and Tom Hanks - was it called Splash? I love a good fluff read! Doesn't make them any less entertaining, and I usually devour them just as quickly as a dark, intense read. I'm a fan of sarcastic boys as well, so sign me up for Quince:) Fabulous review Alison, I definitely need to read this one!